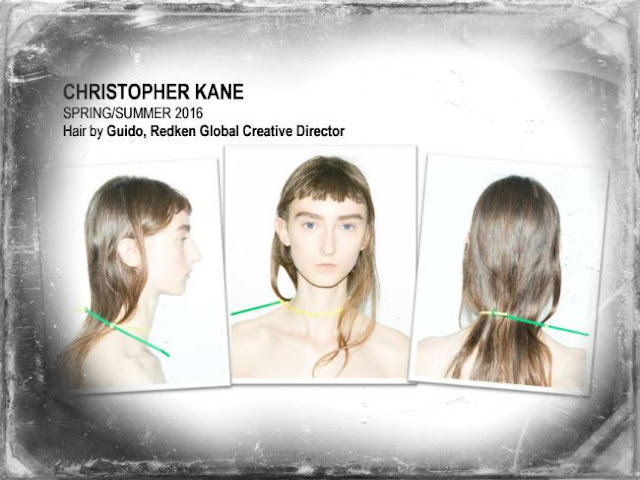 Using custom Christopher Kane cable ties as ponytail fasteners and chokers, Redken Global Creative Director Guido achieved a high-fashion look on the runway at the designer’s Spring/Summer 2016 show. – My thoughts … “custom Christopher Kane cable ties” is absolute nonsense. It isn’t art, it isn’t pretty, it’s just plain silly. 2. Create a natural center part using fingers and allow hair to fully air dry. 3. Gather the length of the hair into a low ponytail and secure with cable tie or other accessory if desired. 4. Finish by liberally spraying Redken shine flash 02 glistening mist all over hair for added shine.